Friday Fish Fry during Lent. Stewardship at Christ the Redeemer is an integral part of our parish. We engage in the lives of our Church and community through the various Stewardship efforts at CtR. We strive to “serve one another as good stewards,” (1 Peter 4:10) through our many ministries at CtR. Please prayerfully consider your family’s role of Stewardship at CtR. God has given us each a unique gift. Let us joyfully return a portion of that gift to God! See our full list of ministries below. The headings will link to the full webpage of each ministry. CtR has a Catholic school that welcomes Pre-K 3 through 8th grade students. Our purpose is to foster academic excellence with a love of God and neighbor that inspires and challenges our children to become leaders who proclaim the Gospel of Jesus Christ in word and action. Because of our state-of-the-art facilities, we are able to provide cutting-edge educational tools and resources. Contact us at 281-469-8440 or visit ctrschool.com. Our purpose is to provide a safe, loving Catholic Christian environment where children learn through participation in developmental and age-appropriate experiences. Our curriculum provides activities to support and enhance each child’s spiritual, cognitive, social, emotional, physical, creative and language development. Our Preschool programs are: 18 months old - Monday and Wednesday or Tuesday and Thursday; OR 2–4 years old - Monday, Wednesday and Friday or Tuesday and Thursday. Tours are conducted at 10 a.m. on Wednesdays. Contact Genesis ECP at 832-678-5432 or visit ctrcc.com/genesis. Acolytes are commissioned by the Archdiocese to serve the faithful and assist the priest or deacon in the celebration of the liturgy. Members of the altar linens group clean the various altar linens and altar server robes used at Mass each week. This ministry provides the younger members of the parish an opportunity to function as lay ministers by reverently assisting the celebrant and/or deacon during Sunday Mass and special liturgies throughout the year. Individuals must have completed the 5th grade. Art and Environment team working to prepare the church for the Christmas liturgies. Children’s Liturgy of the Word is a worship experience that allows children to hear the Scriptures in words they understand. The program follows the same structure as the Liturgy of the Word for the entire assembly. The Eucharistic Ministry to the Sick provides Eucharistic visitation to those unable to attend Mass, such as the homebound, nursing home residents and those who are hospitalized. Extraordinary Ministers of Holy Communion (EMHC) assist the celebrant with the distribution of the Eucharist during Mass and Eucharistic celebrations. Interested registered parishioners must be faithful Catholics who have received the Sacraments of Baptism, Confirmation and First Eucharist, are at least 18 years of age, and are in good standing with the Church. Members of God’s Housekeepers meet each Monday morning to maintain the cleanliness of the church. Greeters and ushers help build hospitality within the church and reverently provide assistance or specific direction to those in need before, during and after the liturgy. Lectors proclaim the word of God clearly so that all who hear may respond. The members of this ministry help with printing formation packets, preparation of the church for weekend Masses, as well as provide assistance during Holy Week and Christmas. Mass Coordinators help schedule Extraordinary Ministers of Holy Communion by Mass. During each Mass, sacristans assist, facilitate and coordinate preparations for the liturgy. Anyone discerning service as a sacristan will serve first as an Extraordinary Minister of Holy Communion for at least two years and must be Safe Environment trained. The Sewing Ministry creates baptismal bibs for infants at baptism. Parishioners are encouraged to spend an hour each week before the real presence of Christ in adoration and prayer. Commit to spend just one hour a week in the chapel. The goal of our Vocations Committee is to foster and support vocations to the priesthood, consecrated life and permanent deaconate by creating a “culture of vocations” within the parish. CtR Choir during its "Rejoice!" Concert in 2015. The Music Ministry provides music leadership for all parish liturgies, including Masses, weddings, funerals, and prayer and reconciliation services. Parishioners are invited to share their musical talents through the Music Ministry. For all music ministries, contact Director of Music Ministries Bridget Wenk at bridget.wenk@ctrcc.com. Cantors primarily lead the assembly in singing the psalms during Mass. This group ministers through guitars, piano, drums and other instruments. Members are youth and adults. These parishioners are needed to monitor the sound board at any Masses where choirs sing, usually 9 and 11 a.m. and 5 p.m. Sundays. This choir ministers to those mourning the death of a loved one by singing at funeral Masses. The Baptism Team teaches parents and godparents about the Sacrament of Baptism for infants (0-6 years old). Families work together during the Sacrament Preparation process. Preparation for children is separate from and in addition to grade level Religious Education classes. There are two processes: one for children 2nd to 5th grade, and another for 6th-8th grade students. Youth are prepared for the Sacrament of Confirmation through a two-year process beginning as early as 9th grade. Catholic adults who never received the Sacrament of Confirmation are encouraged to if they are active in their faith. The formation process focuses on those who are ready, through maturity and a change of heart, to respond more deeply to God’s invitation of love. This group meets the second and fourth Tuesday of the month to discuss, plan and implement a variety of programs to serve the needs and interests of the entire faith community. ACTS (Adoration, Community, Theology and Service) retreats allow an opportunity for men/women to focus on their faith and its application during their daily lives, to build purpose in their prayer life, to increase their presence at the liturgy, and to cultivate friendship among members of the church community. Symbolon: The Catholic Faith Explained is a DVD program. Over 10 weeks, we will take you on a journey through the core beliefs and teachings of the Catholic Church with the goal of helping Catholics better know and understand their faith. This small group study explores the richness of our Catholic faith and the Divine Mercy message through the writings of St. Maria Faustina Kowalska, the Bible, the Catechism of the Catholic Church and the Formation Manual. Christ the Redeemer subscribes to a dynamic online platform called Formed.org. Every parishioner will have 24/7 access to the best Catholic content on any device, including your computer, smartphone and tablet with internet access. Our parish code is 3JZDRJ. Visit formed.org to get started. If you are urged by the Spirit to revive your connection with Jesus Christ and the Church, we&apos;d love to help restore the most important relationship of your life. Alive in the Spirit demonstrates how CtR parishioners celebrate Christ’s love through song. It is truly fellowship founded in Christ. It is an evening of praise and worship music, Scripture, food and fellowship in a relaxed atmosphere. Catholic Scripture Study has session during the day and in the evenings..
Catholic Scripture Study (CSS) is a program whose members learn the Scriptures and come to deeper understanding of their Catholic faith in a setting that builds Christian fellowship. The Thursday Adult Bible Study uses the Collegeville commentary and emphasizes the Catholic outlook and application of Bible wisdom to everyday life. The Friday Morning Women’s Bible Study welcomes women of any age and denomination. Journey Through Scripture (JTS) is a parish-based Bible study program facilitated by the St. Paul Center for Biblical Theology. Distinctively Catholic, JTS takes a holistic approach, looking at the entire Bible and how all of its parts work together. Christ the Redeemer ofrece varios estudios de la Biblia para adultos de habla hispana. Vea algunas de las siguientes opciones. El Programa de Formacion en Ia Fe de CATOLICISMO hace vivir la belleza, Ia bondad y Ia verdad de la Iglesia para que usted pueda entender mejor su fe y compartirla. Aprende a Orar para Aprender a Vivir. Te invitamos a profundizar en el conocimiento del Señor y de ti mismo, atraves de esta experiencia personal con Dios. We meet every Thursday morning for a rosary after 9 a.m. daily Mass to pray for the holy priesthood and vocations. Contact Maria Barber at 832-275-7962 or mebarber@sbcglobal.net. That Man is You! is an interactive, multimedia men’s program focused on the development of authentic male leadership. It harmonizes current social and medical science with the teachings of the Church and the wisdom of the saints to develop the vision of man fully alive. Catholic Men&apos;s Fellowhsip meets Saturday mornings. Catholic Men’s Fellowship is a ministry dedicated to developing the faith-lives of Catholic men, allowing them to embrace and exemplify the Catholic life in the world today. Growing Relationships in a Christian Environment (G.R.A.C.E.) is for women with the desire to grow spiritually as individuals within a community of believers. Learn how to better manage your money and your life. CtR hosts Dave Ramsey’s Financial Peace University to teach God’s way of handling money. The Family Life Office offers many programs for couples in all stages of marriage. Programs are for the newly married, Engaged Encounters, validation of civil marriages, the 10 Great Dates series and more. For all marriage and couple enrichment ministries, contact Director of Family Life Christy Wright at christy.wright@ctrcc.com. Marriage Sponsor Couples is a parish-based program in which a married couple serves as a “sponsor” to an engaged couple. In five sessions, the sponsor couple helps prepare the engaged couple for the Sacrament of Marriage. CtR offers various marriage enrichment programs for CtR Date Night. Engaged and married couples in Natural Family Planning (NFP) classes learn a method of family planning which is safe, effective and consistent with good moral practice according to Church teachings. Teams of Our Lady (T.O.O.L.) is for Catholic married couples who search for Christ in their marriages and everyday lives. Familia is a four-year Catholic study program that helps women understand God’s plan for them as a woman, wife and mother. The Rite of Christian Initiation helps those who want to become Catholic journey wtih a sponsor. The Rite of Christian Initiation of Adults, or RCIA, is the process through which individuals, adults and children, journey to learn more about the Catholic faith. For all RCIA questions, contact Coordinator Julie Cook at julie.cook@ctrcc.com. RCIA Classes Adults: Inquiry sessions take place from 7-8:30 p.m. every Wednesday in Room 301 of the chapel building. Children/Youth: The youth process runs concurrent with the adult process. Because no journey should be traveled alone, this ministry needs people willing to share their faith with those preparing to become Catholic Christians. Sponsors must be confirmed Catholics (16 years and older), active in the Catholic faith and willing to share their faith with others. Christ the Redeemer hosts a support group for adoptive and foster parents. Catholic Charities facilitates the group, which is open to adoptive parents with current or finalized domestic, international or CPS placements. Call Barbara Feliciano, LCSW, at 713-874-6597. Catholic women at least 18 years of age may be interested in joining the Catholic Daughters of the Americas. The purpose of the organization is to participate in the religious, charitable and educational Apostolates of the Church. CAM answers the Gospel call to “feed the hungry, cloth the naked, and help widows and children” by serving any person in need. CAM operates a food pantry, a resale shop and offers GED and ESL classes. Visit cypressassistance.org. The CtR Divorced and Separated Ministry serves its members who are suffering through these difficult times of the separation and divorce experience. Friends in Need serves the parish community with food for the sick and receptions after funerals. Ministry members greet families when they arrive at funeral receptions, and assist them with any physical needs. The Gabriel Project is a program to reach out to women who need our help to choose life and avoid abortion. The Gabriel Project helps women in crisis by offering Christian love and practical solutions at the parish levels. Each spring, CtR advocates for life, babies and women through the annual Baby Bottle Program. This fundraiser collects needed funds for pro-life ministry in the Archdiocese to support the sanctity of life. Contact Megan Dillingham at megan.dillingham@ctrcc.com. Knights of Columbus at Christ the Redeemer. The Knights of Columbus is the largest fraternal Catholic family organization in the world. Regularly scheduled faith, family and community functions are held throughout the year. The majority of activities are charity related. Visit www.kofc8771.org. The Ladies Auxiliary aids CtR’s spiritual and charitable growth, enhances the social life of parish families, promotes fellowship and love, and performs works of charity. We support various groups, including CtR ministries, CtR Catholic School and Cypress Assistance Ministries (CAM). Ladies Auxiliary also supports the Knights of Columbus Council #8771 activities with approval from its membership. The Prayer Blanket Ministry involves sewing lap sized blankets for members of our parish who are in need of physical or emotional healing. The Respect Life Ministry brings awareness, educates and promotes reverence for all human life. The Serenity Support group offers spiritual support and the healing comfort of God to all who mourn a loss through death. Beginning on Ash Wednesday each year, the Catholic Relief Services (CRS) Rice Bowl is a Lenten faith-in-action program for families and faith communities. The program encourages dialogue in families while standing in solidarity with the global community while making small financial sacrifices during the 40 days of the Lenten season. Coffee and Donuts, during the school year, is a time for members of the community to gather in the Parish Hall to meet one another after Sunday morning Masses, become aware of the many ministries available to them, and view the bulletin boards for news of other parishes in the Houston area. The Spring Festival is Christ the Redeemer&apos;s biggest and only fundraiser of the year! The Annual Spring Festival at CtR is the last weekend in April - providing the greater community with fun and fellowship, but also serving as the parish&apos;s largest annual fundraising event. Many volunteers are needed to fulfill important roles, of varying time commitments, in making the Festival successful. Adults enjoy games, fun and fellowship each week. The Angel Corps help the parish staff with variety of tasks such as copying, filing, posting contributions weekly, helping with mailings and more. The Classics provides fellowship and fun for individuals more than 50 years of age through social and spiritual activities. Fair Ladies of Christ the Redeemer, or FLOC, is a faith, fellowship and social group for women who live in Fairfield and Lakes of Fairhaven and attend CtR. Neighborhood Brunch gathers parishioners by neighborhood or areas for a pot luck lunch at the home of a host family. The CtR Library Committee is dedicated to providing Catholic and Christian-based media to our parish. The Piece Makers work on various projects and arts and craft to sell, which benefit the church. St. Anne’s is a ministry for mothers of all ages that provides opportunities to meet for spiritual, social and educational enrichment. St. Joseph Altar honors our beloved St. Joseph by hosting a spaghetti dinner and a traditional altar in the third week of March. Members take part in the preparation and serving of the dinner, set up and clean up. Members of the Wedding Guild are our parish wedding coordinators. We provide a warm welcome to new parishioners. Young Adult Group social at Deacon Bill Bradley&apos;s house. We are a community of young adults focused on building relationships in a fun supportive environment that allows us to meet new people, serve one another, and grow in our faith. The mission of Christ the Redeemer’s Religious Education (R.E.) program is to bring the “Good News” of God’s love to all children and their families and call them to commit their lives to Christ. R.E. classes are available for children, Preschool through 7th grade. Students from 8th grade through high school are under the instruction of the Youth Ministry. For Religious Education programs, contact Director Kathy Kelley at 281-469-5533 or kathy.kelley@ctrcc.com. Home-based Catechesis allows families to be active in learning and growing in their faith in their homes following the same curriculum used for Religious Education classes at the parish. Catholic Faith Camp is for students entering 2nd-6th grade in the fall. Vacation Bible School is the third week of June and is open to children age 3 (potty trained) through entering 5th grade in the fall. Youth Ministry handles the faith formation of all students in grades 7-12. Students in 7th and 8th grades will attend Rise on Wednesdays. Students in 9-12 grades will attend Encounter on Sundays. For Youth Ministry questions, contact Office Coordinator Stacie McKay at stacie.mckay@ctrcc.com. Encounter is a high energy way for teens of CtR to come together, experience a faith-based program just for them and have an encounter with Christ. Rise is a high energy way for teens of CtR to come together and experience a faith-based program just for them. Our Middle School Summer Camp is a week-long day camp for students in grades 6-8. Core Team is an organization for all adults, whether parents of 6th through 12th grade students or not, to support for the Youth Ministry. Camino is a program of CtR Youth Ministry for students who have already been confirmed and are ready to go deeper into studying their faith and building relationships. Incoming 10-12th grade students can serve as teen leaders for Rise, our middle school youth group, for the school year. Prayer Warriors pray and fast for the Youth Ministry Department. Students in high school who are looking to grow deeper in their faith are encouraged to attend a gender-based discipleship group that meets twice a month. Christ the Redeemer&apos;s Boy Scout Troop helps out with the fire for the Easter Vigil. The Boy Scouts strive to develop American citizens who are physically, mentally and emotionally fit; have a high degree of self-reliance; and possess qualities such as initiative, courage and resourcefulness. The Cub Scouts of America follow the model of the Boy Scouts. Boys in 1st through 5th grade - or those who are 7 to 10 years old - may find Cub Scouting great for them. Family involvement is encouraged. Little Flowers Girls Club is a Catholic mother/daughter club designed for girls ages 5 to 12 and is similar to Girl Scouts. Christ the Redeemer has two nurseries for parishioners and ministries for childcare during Mass and during ministry meetings when scheduled. Noah’s Place, one of the two CtR nurseries, is located off the narthex in the main church. This nursery is open all year during the 9 and 11 a.m. Sunday Masses, except on Christmas and Easter. Children need to be 6 months old (able to sit) through 3 years old. The Ark is next to the Parish Office. It is open during the 9 and 11 a.m. Sunday Masses when school is in session. The Ark has the same age requirements as Noah’s Place. It is also available during ministry meetings and events with no age limit. Our campaign is a part of realizing the long-term vision for the Christ the Redeemer campus and to provide for the substantial growth of the parish. 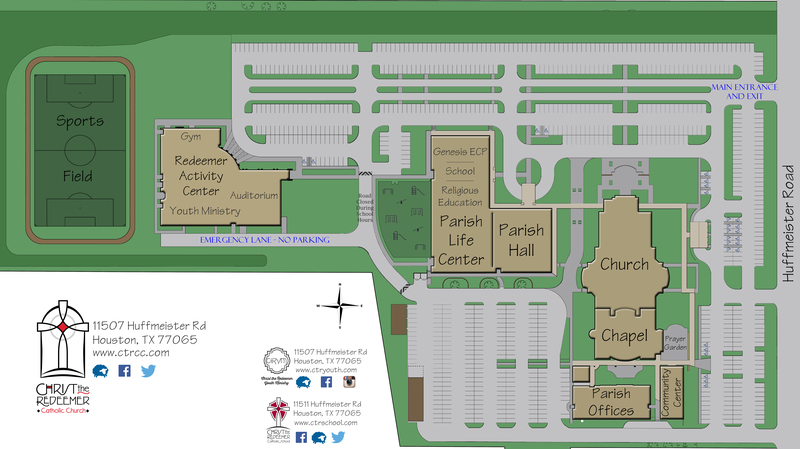 It we have a new Redeemer Activity Center (RAC). The new facility includes a youth suite, gymnasium and auditorium for the use of the entire parish community. Sacrificial gifts of all sizes paid over a multi-year period are gratefully accepted as the church continues to build for the future. Contact Director of Advancement Megan Dillingham at megan.dillingham@ctrcc.com.